The genres of apocalyptic thriller and noir have always nurtured the concept of loneliness. The former magnifies the minuteness of humans in the face of (potentially) extinctual disaster, and in the latter, people are often the life-threatening event or disease—the town of Personville (or ‘Poisonville’ as it is known) in Dashiell Hammett’s crime masterpiece, Red Harvest, is a perfect example of that, and the lone (and lonely) Continental Op, who stalks it as a kind of corruption-immune survivor, wanting to rid the city of what sickens it. In Yuri Herrera’s The Transmigration of Bodies (And Other Stories, July 2016), the two genres are combined to great effect, echoing that loneliness within a disease-ravaged city where the inhabitants hide indoors or only venture out in masks. Hererra gives us all the trademarks of a great noir without turning them into caricature: tight, almost brusque prose (‘Unhappy people aren’t the problem. It’s people taking their unhappy out on you’, ‘Normally it’s the dead that are rotten, not the living’), a restrained but growing sense of paranoia, and characters with titles rather than names—Baby Girl, The Mennonite, The Unruly, The Dolphin—and finally, our lone (and once again, lonely) protagonist, The Redeemer. The Redeemer is, as he could only be in a story like this, a ‘fixer’ for those desperate for a solution to their problems—grateful but then immediately afterwards pretending the amnesia one conveniently reaches for when wanting to forget an embarrassing situation: ‘… they sent small checks and big bottles in gratitude. After that, tho, they didn’t even want to say hey since it reminded them of what they’d been mixed up in.’ Even though there is no real description of him, the impression is had that he must be physically unremarkable at least, the kind of man who has no chance with women unless there is alcohol involved (mezcal, when he manages to bed his neighbour, Three Times Blonde, for a very brief moment)—‘When he first started getting laid he couldn’t quite believe that the women in his bed weren’t there by mistake.’ It’s an amusing nod to the classics—again, Hammett’s squat, ugly Op who knows women only turn on the sexual charm when they need something from him. If the traditional plague call was bring out your dead, here it is one to bring out the living and show their behaviour—surprisingly it is pretty much business as usual for all involved, with the exception of drinking more alcohol than water due to shortage (the opening scene of The Redeemer waking to a raging thirst only to find the tap dry and having to scrape an inch of two of water out of the toilet cistern is enough to make anyone reach for the mezcal). It highlights the perseverance of humans—not out of the need to survive as much as to continue with the luxury of being selfish and ignore the actual world—to go as far as creating an imaginary apocalypse within a very real one . ‘But man, for this to all go down now’ as he wonders, is just the usual—when you are running out of pieces on that chessboard, you start using your own family to keep that game going, because the game is all you’ve got, all you know how to do. ‘Death … is a lonely business’ says a character in a Ray Bradbury short story of the same name. In The Transmigration of Bodies, the deaths of Baby Girl and Romeo without doubt are just that, but it is nothing compared to the lonely business of life that echoes as it roams the diseased streets of The Redeemer’s nameless city. Yuri Herrera was born in Actopan, Mexico, in 1970, studied Politics in Mexico, Creative Writing in El Paso and took his PhD in literature at Berkeley. His first novel to appear in English, Signs Preceding the End of the World, was published to great critical acclaim in 2015 and included in many Best-of-Year lists, including The Guardian‘s Best Fiction and NBC News’s Ten Great Latino Books. He is currently teaching at the University of Tulane, in New Orleans. Lisa Dillman (translator) teaches in the Department of Spanish and Portugese at Emory University in Atlanta, Georgia. She has translated a number of Spanish and Latin American writers. Some of her recent translations include Rain Over Madrid; August, October; and Death of a Horse, by Andrés Barba, and Signs Preceding the End of the World by Yuri Herrera. Tomoé Hill is deputy and reviews editor at minor literature[s]. Her work has also appeared in Berfrois, Numéro Cinq and New Orleans Review. 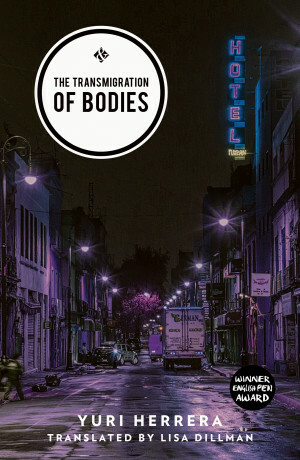 Posted in Book reviews and tagged the transmigration of bodies, yuri herrera. Bookmark the permalink.